"I'm proud to have you as my rival." "Feel the power that's been gathered by the strongest sword of the Dimension Police!" The famous "Gladiator" of Team Caesar. Gai is Yuri's brother, and Koutei's self-proclaimed bodyguard. Though he has a strong in-universe fan following, Gai is probably the least skilled of the three Caesars. In the aftermath of Team Caesar's loss to AL4 at season 1's first national, Gai and his team organize a training camp with Team Q4. Observing Kai Toshiki at a distance, Usui concludes that while the boy is strong, he's not the only member of Q4 to watch out for at the next competition. True to this, Gai's match with Kamui in the national semifinals ends in his loss, and he's forced to pass the bar over to his sister. During the Asia Circuit, Gai reprises his role a part of Team Caesar. Gai faces Fajr Ali in the finals of the Circuit's Singapore stage, but is defeated by the boy's powerful Lox build. Meeting up with the likewise defeated Yuri in the aftermath, he's left to watch Koutei and Christopher struggle in the third match. Gai's Dimension Police deck is geared around Super Dimensional Robo, Daiyusha. He has less of an overall focus on the Enigmen line, appearing to only use the clan for its grade security, and instead gears his units toward a very traditional DP build. In addition to Cosmo Beak, he uses Enigman Shine to empower Daiyusha before making his vanguard's attack. 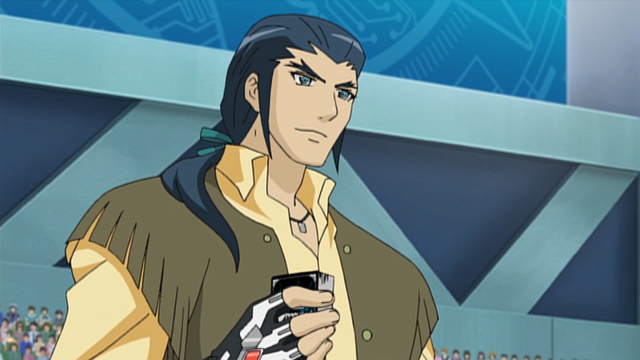 During the Seoul stage of the VF Circuit, Gai switches to a Dimensional Robo deck minus its crossride, instead focusing on old school Daiyusha tactics.